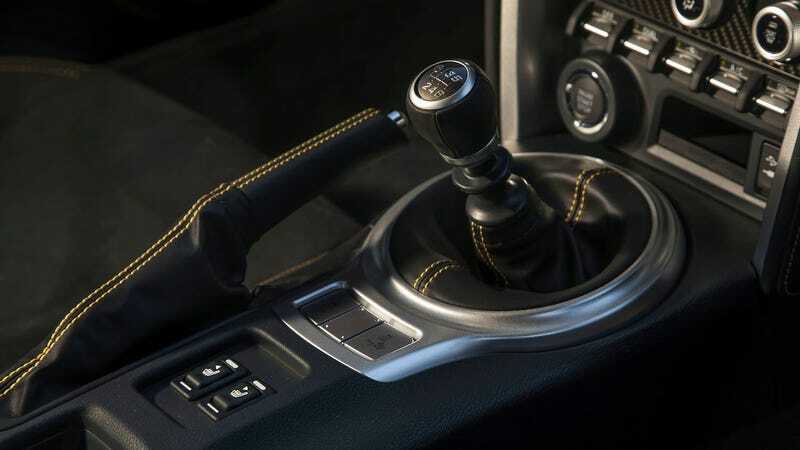 The manual shifter in a 2017 Subaru BRZ Yellow Series. Subaru wants to have the safest cars in the world and the manual transmission, the one good thing left in this world, is holding that up, according to a report from AutoExpress. That led an executive at Subaru U.K. to give us all a big scare, with ideas of a future where BRZs and WRX STIs all shift their own gears. While carmakers keep debuting crossovers and SUVs because they make major cash and while they keep pairing with autonomous tech companies because no one wants to drive anymore, it’s been nice to have Subaru stick with its driving-oriented roots. But Subaru U.K. director Chris Graham said recently he doesn’t seem confident manuals will stay around, which was, frankly, terrifying. A spokesperson for Subaru of America, on the other hand, told Jalopnik that the U.S. market is “invested in manuals.” That’s a good sign, at least. According to AutoExpress, the factor behind Graham’s view of the manual having a shaky future is Subaru’s EyeSight. EyeSight is a driver-assistance feature that uses cameras to operate automatic emergency braking, aspects of cruise control, and lane-departure warnings. Subaru’s U.S. website says it’s available on certain Crosstrek, Forester, Impreza, Legacy, Outback, and WRX models, but problems apparently come when a car has a manual transmission. “... There are certainly no rumours we’ve heard that manual will continue, or Eyesight will be [offered] with manual. “My gut tells me it will be Eyesight with Lineartronic ongoing and long term. They want to steal the mantle of the safest car in the world. I think if they do that, then they say ‘here’s a manual without Eyesight’, they’ll just ruin that [message]. “We’ve spoken for many years about [the safety granted by] boxer engines and symmetrical all wheel drive. We’re now talking about safety that’s not just underpinned by the chassis, but by Eyesight, boxer and symmetrical all wheel drive. But a spokesperson for Subaru of America said manual transmissions are big for the company in the U.S. market, and didn’t express any doubts about its future. Thank you for having humanity, Subaru of America. We hope it stays this way.